When Nebraska went down 14-0 to Colorado on Saturday, defensive coordinator Erik Chinander didn’t know what exactly was coming from his defense the next time they took the field, but he had a pretty good idea. “They were dialed in, they were focused, they were ready to play, they wanted to go back out and play defense,” he said after practice Tuesday when he met with the media. “I knew if we got back out there, I didn’t know exactly what was going to happen, but I knew it wasn’t going to be a give-up, I knew it wasn’t going to be a surrender." Husker players have since said that approach wasn’t happening last season. Chinander said Tuesday there were numerous guys on the sideline trying to keep the team in it. “Everybody was stepping up,” Chinander said. “You had Mick [Stoltenberg], you had Luke [Gifford], you had Ben Stille talking, you had Dedrick [Young II] and Mo [Barry] and Aaron Williams. Guys were all over the place saying, ‘Hey we’re going to go out and get this thing taken care of. Don’t give up. Let’s stick together.’ It was really awesome to see. Given the nature of the loss, there were some sad looks that lingered in the building until Monday morning, but when the team got into the film room and got to work, Chinander said he was pleased with the team’s response. >> Quarterback Adrian Martinez did not practice with the team on Tuesday. >> Asked specifically how the defensive backs held up against a heavy-pass attack from Colorado on Saturday (the Buffs threw it 50 times), Chinander said he thought they did well. “They’ve been in some situations now in a live-game setting where we’re asking them to play a little different coverage than they have in the past, some more tight coverage, some more man coverage and I think some of those reps are good,” Chinander said. “The loss, while no one wanted it, highlighted some of the things we’ve been preaching throughout fall camp and it just didn’t come to fruition until they actually see it on television and they hear it from you guys and the fans. Dewitt virtually said the exact same thing about outside backer Tyrin Ferguson. >> On Monday, safety Tre Neal said the two plays that corner Dicaprio Bootle were beaten deep on were actually the responsibilities of the safety not getting over the top and not necessarily on Bootle. >> Nebraska handed out the Blackshirts on Monday and seven players received them: Stoltenberg, Gifford, Barry, Young, Ferguson, Bootle and defensive end Freedom Akinmoladun. 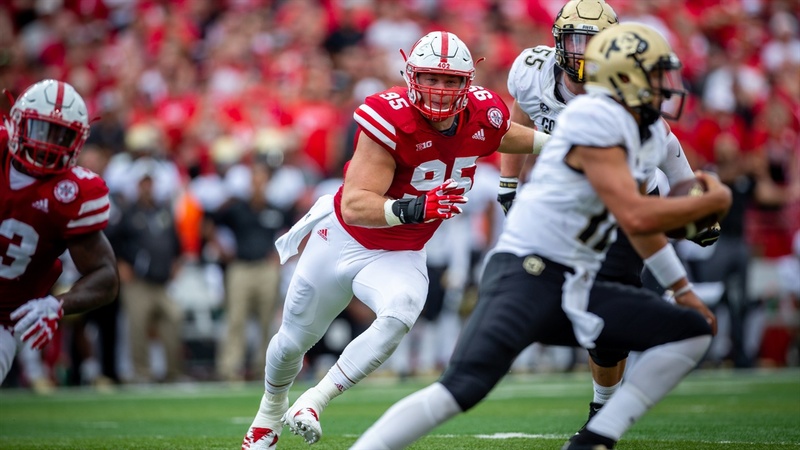 It seemed as if guys like defensive linemen Khalil Davis and Ben Stille and safety Deontai Williams might have a shot as well, but Frost said Monday they didn’t want to hand all of them out at once. Chinander added to that on Tuesday. “I had to talk to every kid that didn’t get one that maybe you guys think deserved one, maybe the fans think deserved one,” he said. “Some of them it’s ‘You played great in the game, now you need to compete with yourself in practice. Maybe you didn’t go to class, maybe you’re late for meetings, maybe it’s other behavioral issues that we need to correct,’ but there’s a reason why each and every one of them did or did not get a Blackshirt. Chinander said several guys were right on the cusp after their game performance, but the body of work wasn’t enough to push them over the top. Chinander, like Frost, said more could be coming in the next few weeks or at some point this season.